To improve your overall health and well-being, different methods exist. Meditation is certainly one of the most powerful ways to achieve this. Tremendous benefits are associated with this practice, and this includes: relaxation, reduced stress, improved emotional management, enhanced awareness and more. While these days many people are aware that meditation is an excellent lifestyle habit, some confusion still exists in regards to the different types of meditation and meditation techniques that are available today. This article should give you a clearer insight. Modern psychological research defines and characterizes meditation in various ways but globally, the role of attention is the main criteria when it comes to establish a typology. In that way, depending on the direction of mental attention, two general meditation categories have been outlined: Focused Attention (FA) and Open Monitoring (OM). This meditation type implies that the attention is focused on a chosen object. In fact, the focused attention could also be on an image, a sound, the breath or even a sensation. Such a meditation session generally lasts from 15 minutes to 1 hour. Scientific studies suggest that different types of meditation generate different brainwave patterns. In the case of Focused Attention meditation, Gamma and Beta waves are created. If you’re interested in this type of meditation, you may want to explore Zen meditation or Metta meditation for example. You’ll find more information further below in the article. In Open Monitoring meditation, specific techniques are used to evaluate the activities that are taking place in the mind. It also involves monitoring anything that enters your field of awareness. It’s based on basic meditation principles. You are not supposed to identify or try to manipulate any thoughts that arise, but simply monitor them. This meditation type is meant to increase one’s awareness and mastery of thought processes. According to electroencephalographic (EEG) measurements, Open Monitoring meditation generates Theta waves. If you’re interested in this type of meditation, you may want to check out Vipassana meditation as well as Mindfulness-Based Stress Reduction (MBSR). You’ll find further information below. A third type of meditation could be added to this standard typology: Automatic Self-Transcending (AST). The practice of such a meditation type transcends (goes beyond) the activity itself. There’s no focusing or monitoring. The term “automatic” implies that innocence is a key point here. There’s absolutely no attempt to sustain any particular condition at all. Transcendental Meditation (TM) exactly fits in this category. More information is given further below. AST meditation type creates Alpha brainwaves. This is a type of meditation that involves a silent mantra technique that was developed by Maharishi Mahesh Yogi. This technique is effortless and allows the mind to “transcend”, i.e. to enter into a transcendental state of consciousness which is described as “restful alertness” by neuroscientists. Maharishi Mahesh Yogi taught the technique to his followers in the mid-1950’s along with various spiritual and religious teachings. Transcendental meditation involves the use of a special sound or mantra, and it should be practiced for an average of 15 minutes twice each day. It provides several benefits including stress and anxiety reduction, enhanced brain function and improved awareness. Mindfulness-Based Stress Reduction or MBSR is a meditation program that was created by Jon Kabat-Zinn, a Professor of Medicine Emeritus. This is a meditation technique used to help people to handle various pain complications and life issues. More specifically, it is a method that involves various mindfulness meditation techniques, yoga and body awareness to provide multiple well-being benefits. In recent years, this practice has become increasingly popular, and has been the subject of plenty of scientific studies. It has also been classified as a program that is focused on the gradual acquisition of improved awareness and presence. Vipassana means “to see things as they really are”. Vipassana meditation is a Buddhist type of meditation that refers to knowledge and awareness into the real nature of reality. In particular, it is part of the Theravada tradition, and it refers to the knowledge of the ‘Three marks of existence’. This includes impermanence, suffering, and lack of satisfaction. It involves the use of a mindfulness technique of breathing that is combined with meditation on impermanence. This is believed to provide enlightenment of the real nature of reality as well as in managing various life complications. In Japanese, Za means “seated” and Zen means “meditation”. So, Zazen simply means “seated meditation”. Zen meditation refers to a type of meditation that is used to achieve a better understanding of the nature of life and existence. It is classified as one of the main aspects of the Zen Buddhist practice. This type of meditation is used to suspend any type of judgmental thought patterns. This includes letting go of words, ideas, images and inconsistent thought patterns. In Zen temples and monasteries, Zen practitioners gather in meditation halls called Zen-dō. Some of the main types of zen meditation include breath meditation, observing the mind, intensive group meditation, koan practice and more. In Pali language, Metta means “love” (in a non-romantic sense), benevolence, friendliness or kindness, hence “loving-kindness” for short. It is a type of meditation that is meant to help one develop a good will and compassion. This meditation style mainly originates from Tibetan Buddhism. Metta meditation also involves the use of special phrases which are meant to influence the thought patterns in the brain. The first stages of the meditation involve targeting oneself with self-love acts of kindness and with phrases like “May I be happy”, “May I be well” etc. The individual is encouraged to practice positive thought. It can also be used to handle self-esteem issues. Then, step by step, the practitioner will send loving-kindness to other people: friends, loved ones, difficult persons, the Universe. Globally, practicing Metta meditation will boost your empathy, acceptance and kindness towards yourself and others. This is a type of meditation where one or more individuals follow the guidance of a trained meditation practitioner or teacher. In most cases, it is done either in person, via a written text, audiovisual resource or sound recording. 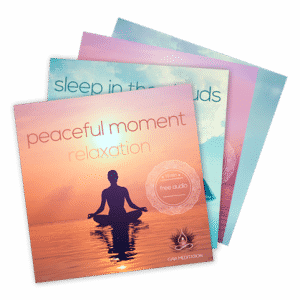 By the way, at Gaia Meditation, we have produced top quality guided meditation audio tracks that you should check out. Guided meditation involves visualization techniques that generate mental imagery. This helps to recreate different sensory perceptions. It is a meditation technique that uses various approaches including guided relaxation, music therapy and more. Plenty of guided meditations exist depending on the objective one may have. It could use aspects of focused attention or open monitoring meditation, and use techniques from all the meditations mentioned above in the article. Moreover, at Gaia Meditation, most of our meditation music embeds the technology of brainwave entrainment (binaural beats and isochronic tones). This technology helps your brain to reach a state that may be difficult to attain if you are not an experienced meditation practitioner. Therefore, if you would like to train your brain to work in different states while you meditate, you should definitely check out our meditation music catalogue. What type of meditation do you prefer? Please let us know in the comments below.